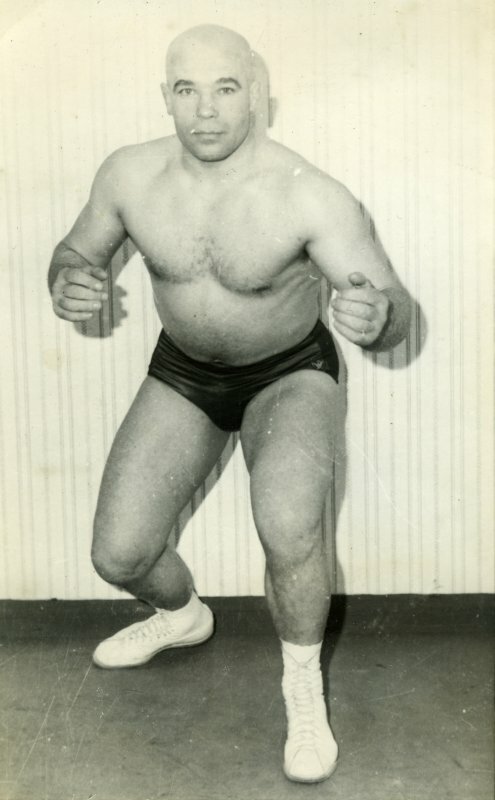 On Saturday the 4th January 2014, the world of wrestling lost one of its greatest legendary icons , known to millions as ‘THE POLISH EAGLE’ or JOHNNY CZESLAW. Born in Crackow , Poland in 1928, CZESLAW MINKLER the boy had a close Family upbringing with his beloved parents, two sibling Brothers: Tadik and Zigmund, plus his older Sister : Jadwiga. Sadly, however when WW2 broke out in 1939 the Family that he loved so much was suddenly and savagely destroyed, following the Nazi invasion and subsequent taking of the region by the Russians,who took them prisoner . John’s Father was killed almost immediately, and the rest of the Family shipped out to Siberia in Russia. The eleven year old was devastated but undeterred, and quietly vowed to escape his internment. The lad soon found a chance for freedom, leaving his beloved Family behind, escaping unexpectedly one day, to make his way alone and terrified at just eleven years old, all the way across Europe to Egypt where he found a welcome refuge and settled for the next three years, before moving on to Tashkent for a year, then finally arriving in England in the Bristol area at the tender age of fifteen years. His Mother died in captivity in Siberia and he was to never see her again, but by some miracle, both his Brothers and Sister all escaped the persecution and found their way to the U.K., where they all settled happily for the rest of their lives. Eldest Brother Zigmund joined the armed forces flying in Lancaster bombers, and was decorated by his HRH King George much to young Czeslaw’s everlasting pride. Tadik and Jadwiga settled happily into their new lives and the Family finally found the peace and tranquility that they had been previously robbed of , so prematurely in life. The teenager soon found work with a Construction Company working on building sites where his outstanding strong muscular frame soon developed , but his Christian name of Czeslaw was difficult to pronounce as is most Polish names, and so he was given the nickname Johnny and before long, he was introduced to a gym where the police trained in Amateur wrestling and where he learned his now legendary wrestling skills. His tough but tragic upbringing stood him in good stead and he soon beat all opposition culminating in having Olympic trials for his country. 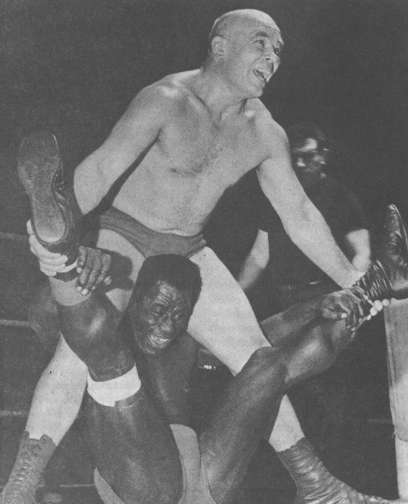 Before long, the world of Professional wrestling beckoned and he joined the ranks of the elite during the 1950s as JOHNNY CZESLAW dropping his surname Minkler. He shaved his head for effect and took the Country’s audiences by storm, thrilling them with his tough skills and touches of comedy . For the next thirty years, there followed the most amazing career with Britain’s most popular Pole, headlining events across the U.K. working with every great name that existed in the world of wrestling, plus travelling back all over Europe, Africa and the far Continents, but not as a refugee this time, rather as the world class star that he was. 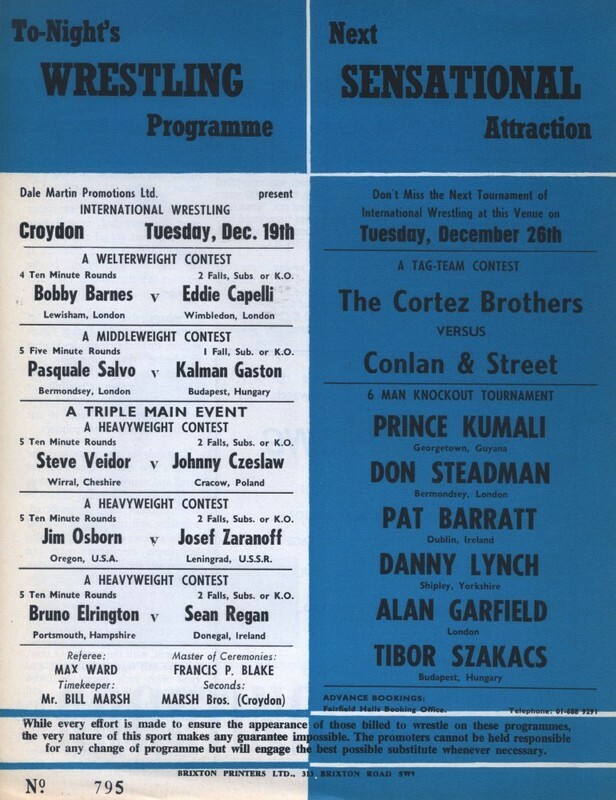 Opponents such as Johnny Yearsley, Banger Walsh , Johnny Kincaid, Joe Cornelius and many others rated the Pole as one of the greatest exponents of the trade that they had ever worked with, and some of their tribute comments taken from Facebook are listed below . Such was his popularity, that he even appeared in several movies such as ‘Creeping Flesh and others with actors and wrestlers like Brian Glover ( Leon Arras) and ‘The Sandwhich Man which starred Michael Bentine. He had a humour that was as legendary as his wrestling prowess and many tales were told in the dressing rooms of his hilarious antics, not to mention his habit of getting his words in the wrong order much to the delight of his many friends and colleagues. 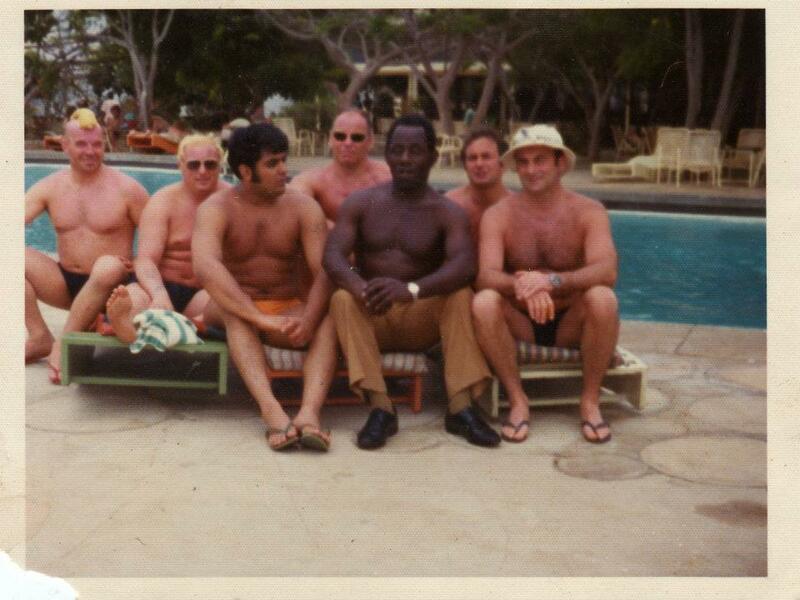 See the photo taken in Kenya with John putting a towel over his head to emulate Billy Two Rivers.Other wrestlers like Wayne Bridges were tickled pink at his version of the English language such as when he was hit in the ring would say loudly 'You swain you', meaning 'You swine'. The good looking athlete soon met local girl Doreen in Bristol around 1951/1952 who was to become the love of his life, courting her in the old fashioned way, before marrying and settling in the local area, before producing two wonderful Sons : Stefan in 1954 followed by Mark in 1965. The Family was a deliriously happy tight unit, and despite the terrible tragedy and hardships suffered as a child, would impress on his own children that life was good and must be enjoyed every day that we are given. In 1980, as if life had not been cruel enough, another blow was suffered when Johnny complained of headaches and nausea, only to be diagnosed with a benign brain tumour. He then underwent successful corrective surgery, but which left him completely blind and unable to wrestle or look after himself ever again. Needless to say he was devastated, but the wrestlers rallied round this brave warrior, raising precious funds to assist him in that time of need. 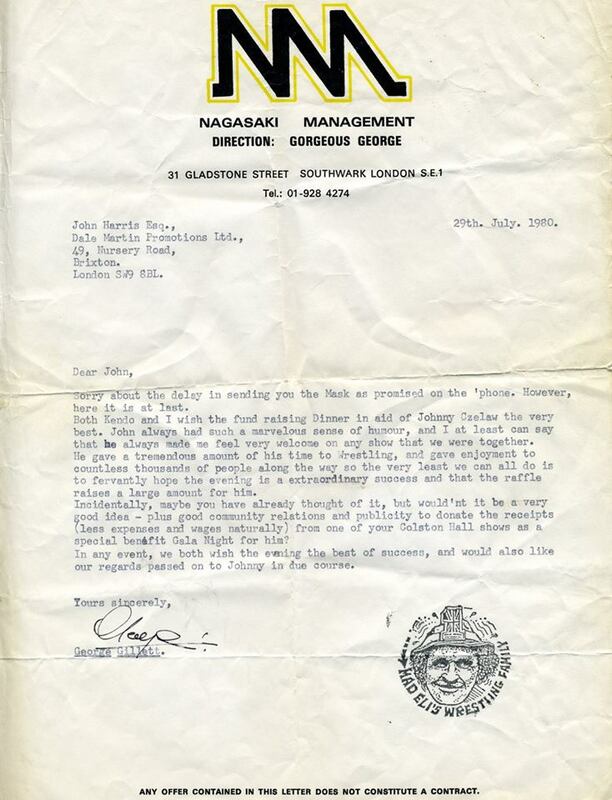 ( See letter from George Gillette to John Harris from Kendo Nagasaki ‘s office). His devoted wife nursed him through the tough times , moving house several times as finance dictated, before finally settling in the last family home and with the love and support of his beloved children, he managed to find a quality of life once again. Yet again though, he picked himself up and with the help of his Son Mark and many friends such as Max and Pam Ward etc., drawing courage to continue with his independent life. 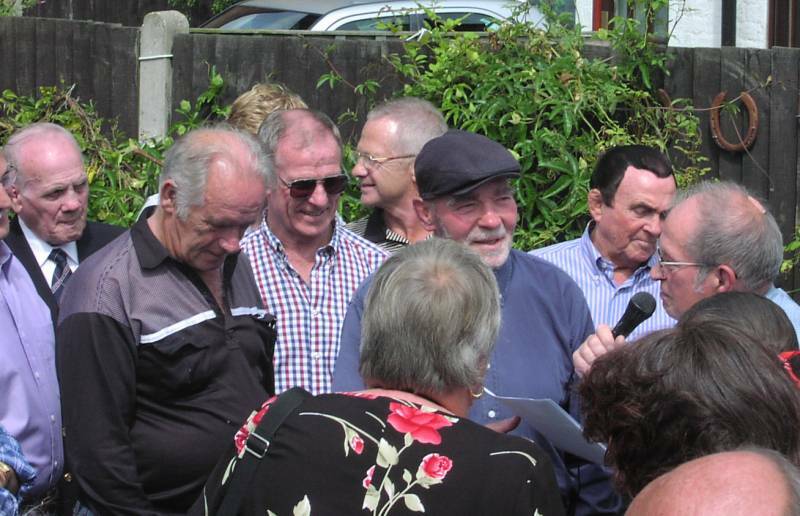 In 2002, the Wrestlers Reunion was to honour Czeslaw with a lifetime achievement award for his amazing life both in and out of wrestling and the presentation was made by Reunion President Joe D’Orazio and Mick McManus. Fans all clamoured to meet and greet the Legendary star who had travelled from the West Country specially to be reunited with his pals. His sense of humour prevailed and he spent several hours bringing the boys to tears of laughter with his tales, making us forget for a moment that he was actually blind. He even thanked the crowd on the microphone, saying how good it was to see everyone again! By 2006 however, John was to lose the love of his life, the Lady that had been his rock and inspiration through all the years, when Doreen sadly died of cancer. Now his Son Mark stepped into the breach and cared for his Father constantly. In 2012, the veteran was taken into Hospital with a hernia problem and the hammer of doom was to strike the gladiator one more time, when the anaesthetic revealed an underlying vascular dementia. 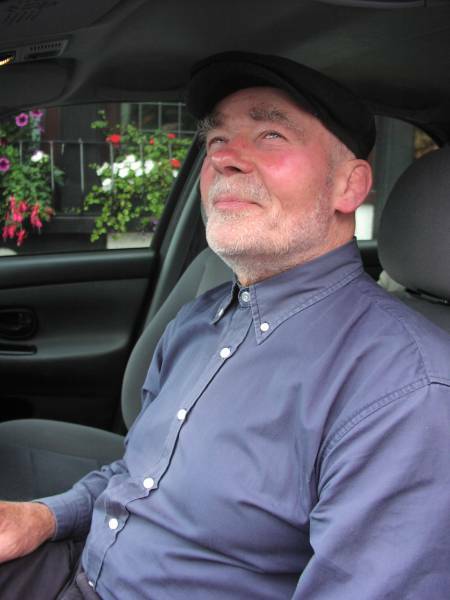 At this point, John was living with Mark who had become his Father’s full time carer, but with John’s deteriorating health making him increasingly reliant on his boy for assistance, finally a heartbreaking and reluctant decision was made to place him into a care home of St. Theresa, where the trained staff could attend to his every whim. For a few weeks, everything was fine with Johnny sitting during Family visits, reminiscing about his childhood experiences in Poland, his wrestling career and Family life , before lapsing into dementia, whereby he recognised no one. This Christmas, he would often mistake night from day and fell over, breaking his hip, before being taken into Hospital on Boxing Day for a successful operation to repair the bone. Unfortunately, pneumonia set in, and the once superfit grappler lost his last great battle and died quietly last Friday the 3rd January 2014. He was 85 and is survived by his Brother Tadik and Sister Jadwiga. (Johnny) Czeslaw Minkler was born into a close loving Family in Poland, suffered terrible sadness and tragedy by eleven, endured inhuman hardships before coming to Great Britain at just fifteen, but found everlasting love and happiness in the form of his wife and two children, coupled with being reunited with his Brothers and Sisters. He could be forgiven for feeling bitterness but being the great human being that he was, felt nothing but love , pride and happiness for our Country that took him in , at the same time retaining a passion for his homeland in Poland . He would often visit the Polish memorial in London to pray for the fallen and to reflect on his childhood and was patriotic to both Countries to the end of a great life. This amazing and brave man was an inspiration to anyone that had the honour to know him. May he now R.I.P. He will now be reunited with his Mother , Father and elder Brother in eternity and also take his well deserved place in the ‘Dressing room in the Sky’ where there is a special welcome awaiting from all his friends and colleagues that have fallen before him . The great POLISH EAGLE : JOHNNY CZESLAW can now finally R.I.P. · Matt Jarrett very sad. Tony Kelly Rest in Peace Johnny Czeslaw. You were one of the true great grafters. Sheila Showell I remember my dad used to watch him when we were kids, must've been a good age. 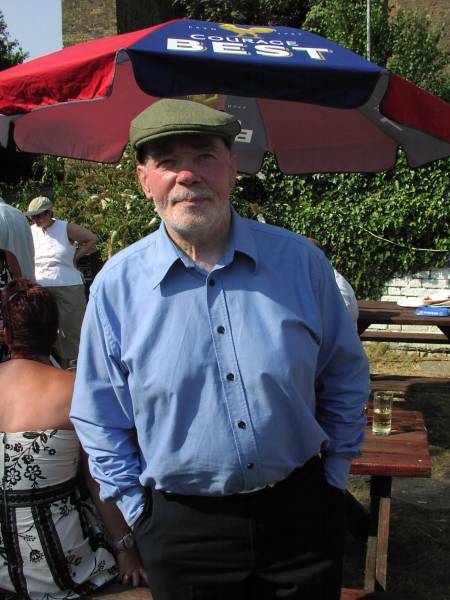 Tony Banger Walsh My dear friend John,he stayed at my house and I remember we went to the Polish Club in Leamington spa.Thats when he introduced me to the polish vodka.I will remember the many bouts I had with him.Also when he had the illness.God bless you John and thank you for the memories my friend and may God bless you. Peter Gurr Hi frank sorry to here about john I work with him way back when, ALL THE BEST FRANK and happy new year Peter. Garry Davies Saw him at the Liverpool Stadium on a number of occasions, remember him as a gentleman out the ring and a great wrestler in the ring. May he rest in peace, and please pass on condolences to his family. Mike Proffitt Sending my deepest thoughts and condolences to the family of this great man. Rest easy, sir! Johnny Kincaid R.I.P Johnny, we go back a long way and you were great to work with, a good wrestler and a great entertainer, the wrestling world as lost another real wrestling legend, God Bless my friend. Ian Dowland Dać wieczne odpoczywanie. What a great guy he was although sadly I did not know him that well, I knew him and used to have chats with him many years ago at Southampton Guildhall, yes a really nice man and a true gentleman. Rest in Peace Johnny Czeslaw now reunited with your dear Wife. 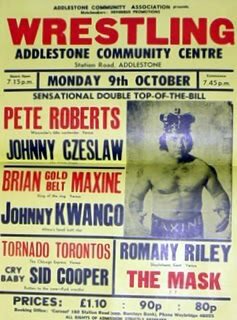 Richard Teubler Johnny Czeslaw was always very popular at the Assembly Hall, Tunbridge Wells. Wendy Mellor Very sad news indeed. Valentyna Holloway Great loss. 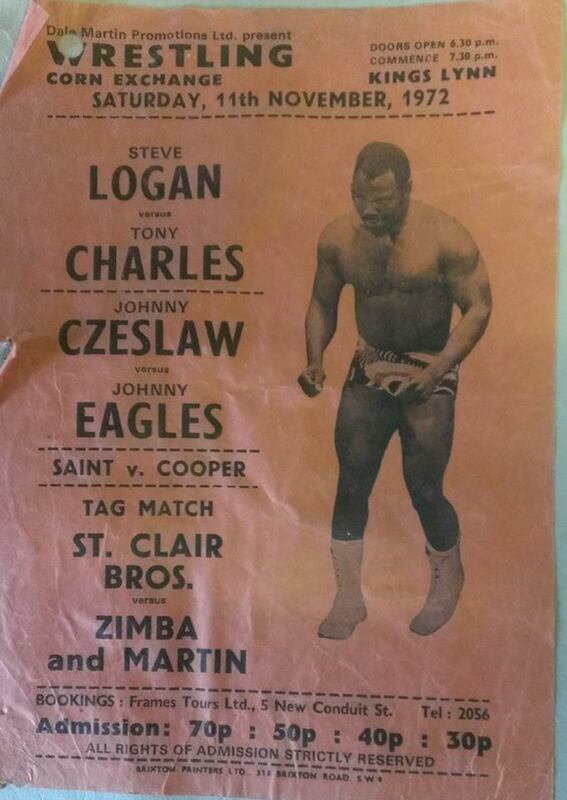 Johnny Czeslaw was a great wrestler and an inspiring man. Steven Tempest-mitchell once more another true wrestler is counted out, but he now marches with the gladiators R.I.P. Darren Ward Tarzan-Boy Always remember him most from the end credits of the Michael Bentine film THE SANDWICH MAN R.I.P.